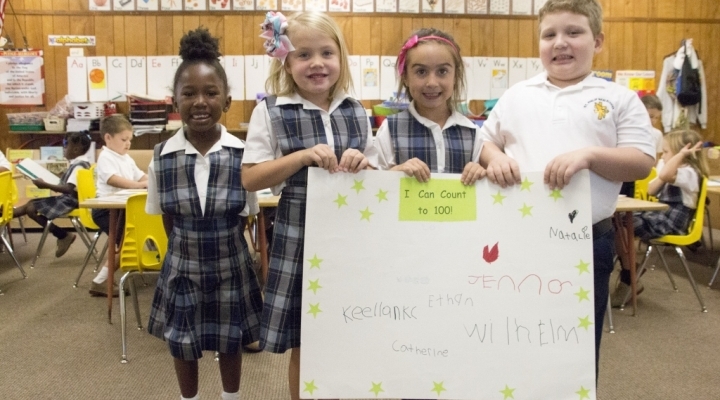 St. Philip Neri School follows state regulation requiring a child entering Kindergarten be five years old by September 1 of the school year. Kindergarten is a full-day program, with the school day running 8:10 AM- 3:00 PM. Extended Day Care is available. Doors in the school open at 7:45 and dismissal is at 3:00. Students start their day with the rest of the school in prayer and the Pledge of Allegiance. Afterwards, they are ready to start their academic routine which includes: Catholic curriculum of math, snack, morning recess, religion, phonics, lunch, rest time, afternoon recess, center time – where they re-visit in a hands- on way the academic themes of the day – and then the “special” class of the day. Kindergarten students are blessed with the opportunity to have six “specials” that happen once a week. These classes include: music, Spanish, library (where the children can bring a book home for the week), gym, art, and computers. Children become familiar with the Christian faith, learning prayers and Bible basics. Students learn to identify and print letters and manipulate sounds. They begin to learn to read, print simple sentences, identify punctuation and are taught comprehension skills. Students learn patterns, count and identify sets up to 30, as well as understand greater- and lesser- than concepts. They learn ordinal numbers and can count by 1’s, 5’s and 10’s to 100. They master addition and subtraction facts up to 5. Students will be assigned nightly homework. This usually involves reading, writing and math. The kindergarten students will be assigned an eighth- grade buddy and will participate in many school-wide activities including the Fall Festival, Santa’s Secret Workshop and Vince’s Flower-Walk, and Field Day. They will attend First Friday Masses and holy days while sitting with their eighth-grade buddies. Kindergarten has small parties to celebrate holidays, including the following: a Halloween parade of costumes, involvement in a school wide Christmas program, The Littlest Christmas Tree play, Valentine’s Day & St. Patrick’s Day celebrations, an egg hunt at Easter, as well as a production of the Peter Rabbit play and a year-end class picnic. 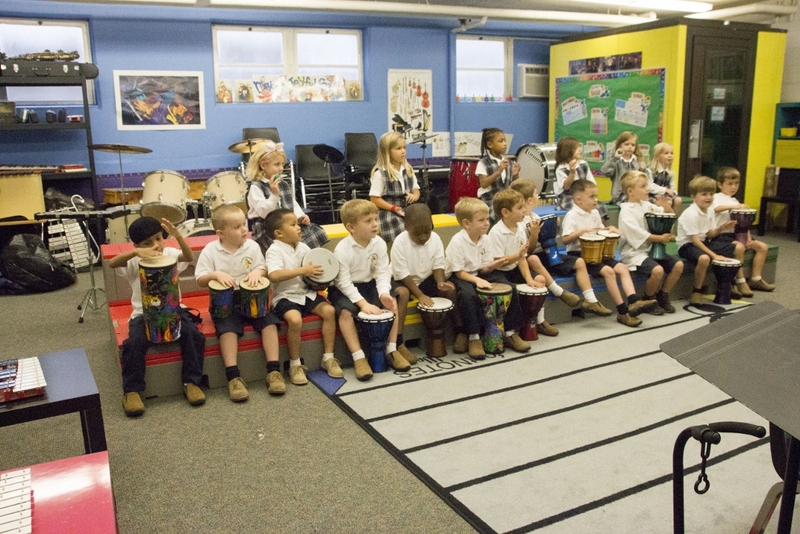 Kindergarten students go on two field trips: a fall cultural trip chosen from many available programs in the Baltimore area and one in the spring to the Science Center. Parents are encouraged to attend; however, all chaperones must be Virtus certified. There is a short rest time that lasts about 30 minutes in the beginning of the year. When spring arrives, this is shortened for longer outside play time. Mats are provided by the school. The school will provide a mat, tote bag, folder, crayons, scissors, and art supply box. Parents are asked to supply pencils, one large pink eraser, and a pack of black fine- point dry eraser board markers. On occasion, we ask for a box of tissues. The students will go outside twice a day, weather permitting. Children are to bring their own snack each day. They can bring lunch from home or purchase hot lunch from the cafeteria. School lunch will costs $3.25 per day and will consist of a main dish with fruit or vegetable and a drink (white/chocolate milk or water). At the end of the academic year, the kindergarten holds a graduation ceremony to celebrate promotion to the first grade. This is held in the school auditorium, with the children wearing pink and blue caps and gowns. Parents, grandparents family and friends are welcome and encouraged to attend.